In Outback Queensland, man’s best friend is as much a part of the psyche as the akubra, flannelette shirts, and RM William boots. Canine companions are considered members of the family, which is why pets are welcome at most establishments across the outback. From sleeping under the stars to enjoying the finer things in life, we’re paws-itive that you’ll be adding chew toys and pet food to your packing list for your next trip out west. Home-away-from-home feels never looked so good as Charleville’s Bailey Bar Caravan Park. It’s no surprise they’ve had a four year winning streak taking out Trip Advisor’s Customer Excellence Award for their quality outback hospitality. On site, you’ll find dedicated pet-friendly cabins that allow the animals to sleep inside for a small room surcharge. Pets even get a souvenir ‘dog tag’ for their stay that reads ‘BBCP Luvs Me’ – how #cute. Give your hound the chance to make friends on the trip by booking in to Bonus Downs Farmstay just outside of Mitchell. 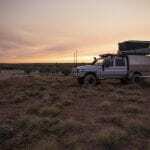 Here, you and pooch can settle into the Outback Queensland way of life at a typical working farm. With stock and working dogs, your doggie will have plenty of friends to meet, while you kick back on the verandah with a cuppa and book. Ahh the serenity. A recent renovation put this Longreach classic on the pet-friendly map, with new tiled ensuite rooms complete with doggy door access for your travelling companion. Talk about kennel-away-from-kennel perks. Located on the doorstep of Longreach’s Botanic walk, the motel has your afternoon walk sorted. 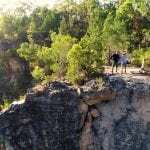 The 2.5km interpretative flora walk takes you to the town centre and is known for its spectacular sunset views over Longreach’s famous Australian Stockman’s Hall of Fame, Qantas Founders Museum, and Kinnon & Co Outback accommodation. It’s a ruff live in Carnarvon Gorge, when there’s just one pet-friendly accommodation option in the region. So, take it from us, if you’re planning on staying in the region book in early for you and your canine companion. Each site in the park provides 360 views of Carnarvon National Park, giving this caravan park unparalleled wake up views. For your best friend, there are pet kennels for daily hire for when you explore the gorge, as domestic animals are prohibited in the national park. 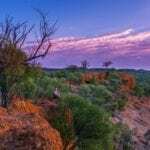 Located on Overlander’s Way half way between Townsville and Mount Isa, ‘Hughie’ as its affectionately known by the locals is hub of natural wonders, and home to an impressive fossil collection – and of course, the Hughenden Allen Terry Caravan Park. Although pets aren’t allowed in the cabin accommodation, they are welcome in the campgrounds. Who knows, your pooch could be the lucky one that digs up a dinosaur bone! 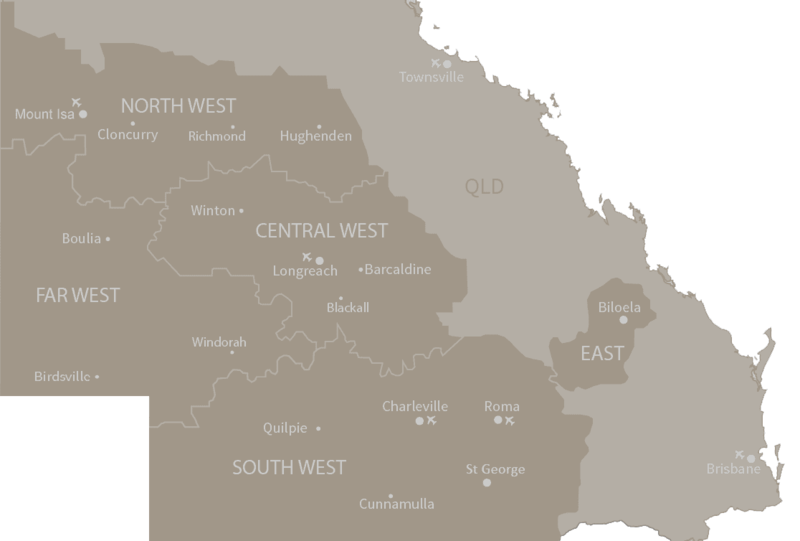 Sprawling across just a casual 52,000 hectares of outback landscape south-west of Longreach, Noonbah Station is run by the Emmott family, and has been for four generations and over 100 years. Large, self-contained campsites allow for your four-legged friend to come along for the trip and enjoy the wide open spaces. The activities for you and your pet to enjoy are endless with plenty of lakes, bush-walking trails, and wildlife on the property. From fishing and swimming to bird-watching and stargazing, you (and your dog) will be hooked on Outback Queensland. Approximately 30km south of Barcaldine, Lara Wetlands guarantees picture perfect tent-views over looking the prolific birdlife that inhabit this wet land. For pooch, there’s no shortage of space to run about – and plenty of smells to sniff with cattle, ‘roos and wallabies roaming the station. If you get tired of sitting under the shade of this spectacular campsite, you can take some time out to pamper yourself with a relaxing swim in the property’s natural Artesian hot spring, a naturally heated pool in the outback. As the campgrounds are located at Lara Station, a working farm, there is always cattle wandering freely through the property. This means visiting pets are required to be restrained at all times. Stay in the heart of Mount Isa at Leichhardt Accommodation and you’ll be treated to one of 138 air-conditioned rooms and a complimentary buffet breakfast daily. With an outdoor pool, fitness centre, and complimentary Wi-Fi, all your travel needs are covered. The best part? Pets stay for free! Grab a drink at the Birdsville Hotel: This iconic establishment is so pet friendly you can take your pooch to the pub! Treat your pet to their first music festival at the Big Red Bash. 2017 was the first year dogs were allowed at the event, proving a great success. 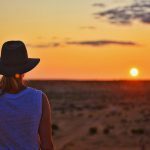 Have you travelled around Outback Queensland with your pooch? Tell us about your pet friendly experiences in the comments below.